November is Prematurity Awareness Month. You can read more about it here. In observation of this, all twin birth stories as well as the majority of Twin Talk posts in November will be about precious preemies. 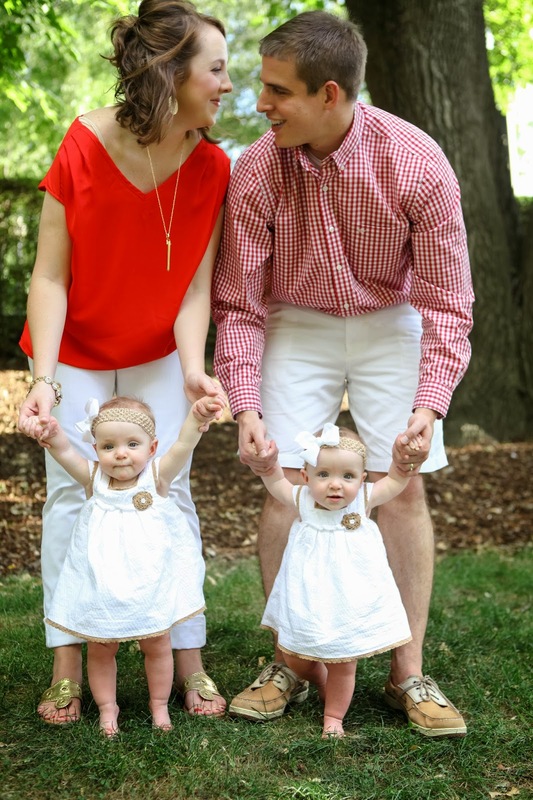 My name is Mary Kate, and my husband, Andrew and I are the proud parents to identical twin daughters. We found out on July 3, 2013, that our babies were indeed mono-amniotic twins. 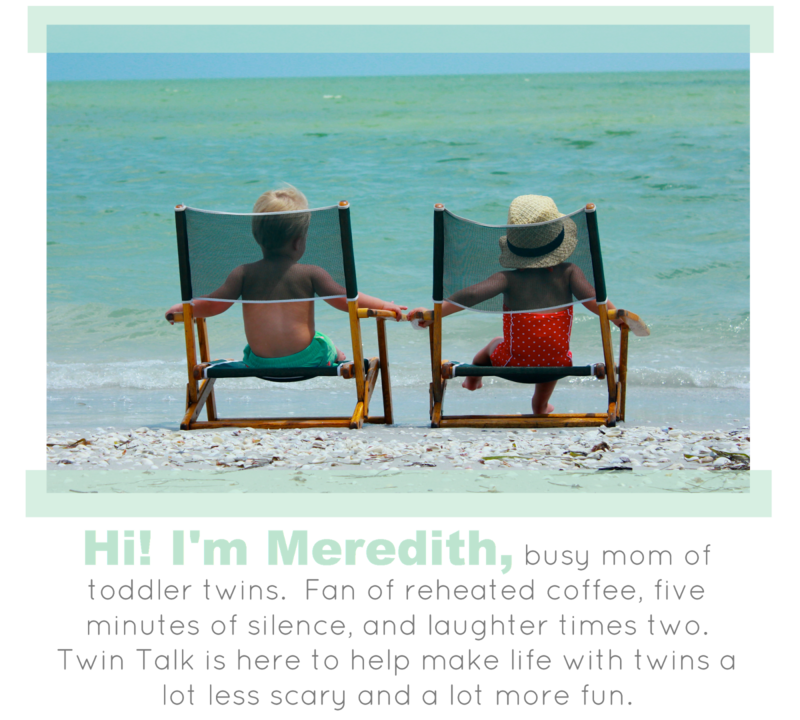 Since "mono-mono" twins are extremely rare, they are considered to be extremely high risk. I switched my prenatal care over to a high-risk specialist, and received weekly ultrasounds until I was admitted for constant monitoring at 26 weeks. Despite four false alarms, the girls made their way into this world via emergency C-section on November 11, 2013, at 29 weeks and 3 days. Leah Katherine was born at 2 lbs. 13 oz. and 15.5 inches, and Amelia Grace was born at 3 lbs. 3 oz. and 16 inches! 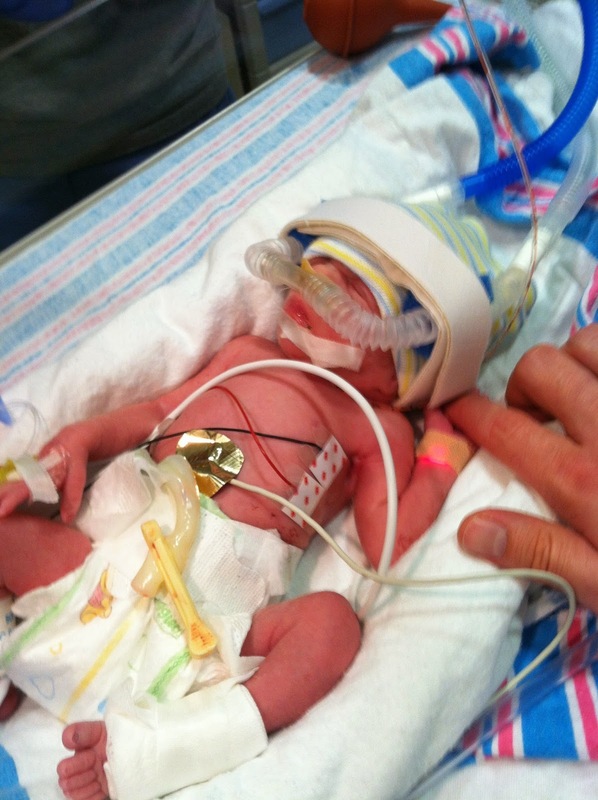 Throughout my pregnancy, we were given a lot of information regarding prematurity and NICU experiences. When I was admitted to UNC Chapel Hill we toured the Newborn Critical Care Center, spoke with parents of preemies, but no amount of preparation can truly prepare you to see your own baby among all the tubes, wires, and machinery. You can read more about our NICU experience in detail here, but we spent 98 days by our girls’ bedside. After one heart surgery, seven blood transfusions, two months of breathing assistance, countless hours of testing and monitoring, five restarts of an apnea countdown, we were finally able to bring our babies HOME! We said good-bye to the doctors and nurses who had turned into family, showed our babies off to the security personnel who greeted us every day, and we left the place that had been our home for the past four months. I was elated, but slightly terrified at the same time. For three months, we grew accustom to having experienced nurses by our side and monitors that gave us the girls' heartbeats and breaths per minute. The past four months of our lives had been anything but normal, so to simply go back to normal life wasn't easy. So, today I wanted to share with you a little tidbit of what I have learned since bringing our preemies home from the NICU. 1. You'll Find Normal Again... One Day. Nothing about our pregnancy, delivery, or the first three months of the girls' life was "normal." We brought our girls home in the middle of Cold/ RSV/ Flu season, therefore, our home became extremely limited to visitors. The girls were almost six months old before they met some of our friends and family! When you arrive home from the NICU no matter the duration of stay or severity of the situation, you have to be your child's advocate. Thus, setting boundaries where boundaries need to be set. For example, we didn't take our girls out in public until the end of April. We only allowed immediate family to visit our home, and don't get me started on my sanitizing craze. We seriously could take stock in Lysol and Purell! In those first few months home, please know that you'll get to "normal" again one day. The day will come when you can openly allow friends and family into your home without any fear, take your children to the park, restaurants, or even to the grocery store (if you are really brave! ), and take the can of Lysol out of your purse. Yes, I am guilty as charged with carrying a concealed can of Lysol. I don't know if you'd consider our family normal, we are pretty crazy, but we are as close to normal as normal can be now and it feels great! This one is a doozy! I can't even begin to tell you all how many times I have caught myself in comparing my girls to other babies, comparing myself as a mother, and even comparing my girls to each other. At three months old, our girls were still the size of an average newborn. For preemies, age adjustment can be a real challenge. I can't pin a developmental post on Pinterest or read a child development book without having to adjust Amelia and Leah's age to where they should be. For example, although they are one (today! ), they are doing the things a 9.5 month old should be doing. So, I have to stop myself at seeing what full-term one-year-old babies are doing and comparing. Instead, I allow myself to think of everything that they have overcome in the span of their short life. 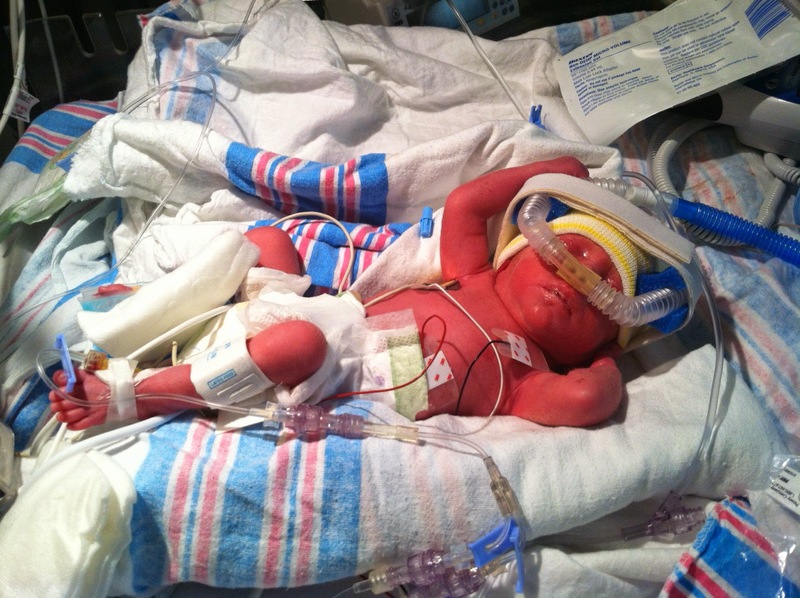 Despite being so tiny and helpless, preemies are so incredibly strong. As their mothers, we have to remember that and be so thankful for our miracles. I have to constantly remind myself of this! Along with adjusting age and developmental tracks, comes a lot of patience. I am definitely Type A, basically... I am your typical control freak. In the NICU, you can't be a control freak because everything is out of your control. Ironically, our NICU experience helped me become more laid back and have more patience when it comes to things that are out of my control. While I work with the girls every day at gross and fine motor skills, language development, etc., I have to keep my patience as it takes them a little while longer to grasp new things. For example, they have yet to hold their own bottles or sip through a sippy cup. Amelia is our diva and has no desire to pick up food by herself, she's perfectly content with someone else feeding her! But, I turn these challenges into a positive by having the opportunity to keep my babies, babies a little while longer! The day will come when they start singing, i-n-d-e-p-e-n-d-e-n-t, but for now I am happy to be their d-e-p-e-n-d-e-n-t.
4. In One Ear and Out The Other. As a "people pleaser" I have never been very good at taking the advice, "Let it go in one ear and out the other," very seriously. I take the words seriously. I take the opinions to heart. I over analyze what people say, but I have learned how to be susceptible to this vital piece of advice. There will be people that don't show you grace. There will be people who condemn you for keeping your babies in isolation. There will be people who don't understand why you carry Lysol in your purse and have 50,000 containers of hand sanitizer. There will be people who share their opinions of what is best for your children. As a mother of twins, I don't have the time to focus on what others are saying much less wash my hair for the day. Therefore, take everything you hear with a grain of salt. It's not the easiest thing to do, but for your sanity (and your husband's!) it must be done. I think it goes without saying that we love those little voices that say "ma-ma" in the wee hours of the morning to wake us up for the day. When we first brought the girls home, I tried to make up for the three months I had not had them at home. I was running all of us ragged each and every day. Our children, preemie or full-term, just desire nourishment, care, and love. For a while, I went through an indescribable sense of guilt that I wasn't the sole caregiver for my babies. Despite that feeling, I could give my babies something that the nurses or doctors couldn't give to them among the tubes, wires, and machines, and that was a mother's love. In our NICU journey, there are two families we became friends with that have to live life without their babies today. There isn't a day that goes by that I don't think about those two mothers. I remind myself how blessed I am to have a to-do list I fail everyday to complete. In the time I should be spending folding clothes, unloading dishes, cleaning, or dusting, I am singing songs. I am playing peek-a-boo. I am changing diapers. I am reading books. I am constantly hiding things and keeping their paths clear. I am watching my step. I am making bottles. I am fixing them something to eat. I am kissing boo boos when they fall down. I am snuggling. I am strolling. I am capturing the moments. I am being a mother, and that is my greatest gift. Even though my entry into motherhood wasn't normal and began with a lot of uncertainty, pain, and challenges, the journey has been so worthwhile. Each child is a gift and a miracle, no matter the circumstances. As for us moms? We are all strong. We are all brave. And, despite our different experiences we are one in the same. We are mothers. We love day in and day out the gifts and miracles we have each received. If you have a question for Mary Kate or simply want to wish her sweet girls a Happy FIRST Birthday, CLICK HERE to email her! As I was reading I kept nodding my head "yes, yes, yes, yes and YES!" Being a twin mama is hard but being a preemie twin mama is a completely different monster. Thank you for creating a space where we can connect and thank you, Mary Kate, for sharing your story. Your girls are beautiful and perfect. Happy birthday, babies! Cannot express how much love I have for this post! It brings back memories from my own experience in the NICU w/ my boys and I am so excited to learn that November is premie awareness month. Thank you, Mary Kate, for writing such a beautiful post! So precious! I love this: "I remind myself how blessed I am to have a to-do list I fail everyday to complete." Lots of love, prayers, and blessings, and happy birthday beautiful Leah Katherine and Amelia Grace! This is so sweet and of course made me cry a lot :) LOVE their "Miracle Baby" shirts!